Enter virtual reality in style! Offering a unique opportunity to learn and explore, Blocksmith Education with programming and video game design. Using the Blocksmith Builder software, learners create 3D games and scenarios, bringing them to life through an extensive logic system. These creations can be played immediately, or uploaded to Virtual- and Augmented Reality viewing devices. With the Blocksmith Education license, instructors have full domain control to create a secure and distraction-free environment to trade and share experiences. 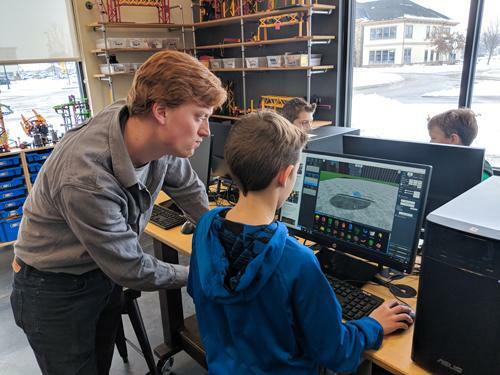 A fun and exciting journey for students and educators alike, Blocksmith allows learning environments of all sizes to create, share and experience the wide world of video game design and virtual reality. Check out this new webinar on Tuesday, March 5th at 2 pm. Our vendor partner JourneyEd is ready to help you bridge the gap between the virtual and physical worlds, AR/VR changes the way students and educators see, imagine, and learn about the world around us. AR/VR creates engagement through exploration and experiential learning in a student-centered environment. 3D visualization is a core competency for STEM professions and our solutions are helping to give students a new avenue to develop this skill. Understanding new concepts can be tough but there’s a noticeable improvement in the learning curve for forward-thinking classrooms who have used AR/VR technology to help their students progress. Improve communications: Go beyond a 2D handout & clarify difficult concepts in 3D. Increase engagement: Engage students & capture their attention with interactive lessons. Streamline learning: Streamline the design process, enabling greater collaborations & faster iterations. Educate for the future: Educate students on the latest tech being used in the industry. K-12 educators, curriculum directors, librarians, technology coaches and more!